The beautiful form, the visible expression of “Christ in you, the hope of glory” is inside Christians like a possibility, a potential. The idea is there, and God uses affliction like a hammer and chisel, chipping and cutting to reveal his image in you. God chooses as his model his Son, Jesus Christ, “For those God foreknew he also predestined to be conformed to the likeness of his Son” (Rom. 8:29). Suffering fashions us into a “holy and blameless” image of Christ (Eph. 1:4), much like a figure sculpted out of marble. 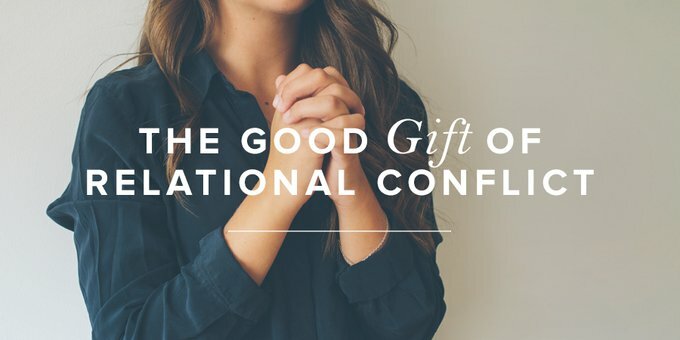 How does relational conflict contribute to our full assurance of good things to come? As we cry out to God to help us love those who have hurt us, it gives us assurance that our faith is real. While it is obvious to us that we cannot produce love for that person who has wronged us, we see the Spirit of Christ at work in us, prompting and empowering us not to defend ourselves but to pray for that person who has wronged us, to love the unlovely. This is hope to hang your hat on—a hope far greater than “hoping” everyone will think you’re pretty great or “hoping” you won’t experience any more relational conflict this month. While I was reminded that this relational conflict would produce perseverance, character, and hope, that didn’t contain my anger for long. I had searched for my sin in this conflict, but I had come up empty-handed. The accused “offender” (me) was really the offended. When your heart is being wrung out like a sponge, an orderly list of “sixteen good biblical reasons as to why this is happening” can sting like salt in a wound. . . .
Purified faith is never an end in itself; it culminates in God. Stronger character is character made muscular not for its sake, but God’s. A livelier hope is more spirited because of its focus on the Lord. To forget this is to tarnish faith, weaken character, and deflate hope. “If you have these qualities existing and growing in you then it means that knowing our Lord Jesus Christ has not made your lives either complacent or unproductive” (2 Peter 1:8 PHILLIPS). “Knowing our Lord Jesus Christ” is keeping your eye on the Sculptor—not on the suffering, or even suffering’s benefits. Amen. May your relational conflict and mine be used of God to produce perseverance, character, and hope. But more than that, may He use these conflicts to draw us back to Himself, our great and only Good. From our team: If relational conflict is part of your story right now, we want to invite you to join our first ever online study: Abigail: Living with the Difficult People in Your Life. Paula will lead us via Facebook LIVE through a brand-new six-week Bible study on responding like Christ to difficult people. Visit this link to learn more. And don’t forget to enter the giveaway below to win two of ten copies of the book (one for you and one for a friend)! We look forward to studying with you!